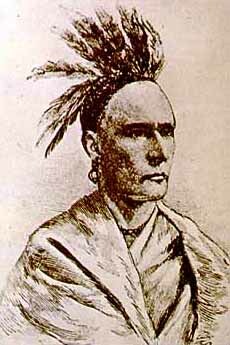 The Cayuga leader who came to be called Logan was born in Pennsylvania circa 1725. Logan's father was a Cayuga American Indian named Shikellamy. Shikellamy later renamed his son after James Logan, a prominent Pennsylvanian and old friend. Logan grew up in Pennsylvania and came to view many whites as his friends. Chief among them was David Zeisberger, a missionary of the Moravian Church. Logan eventually married a Shawnee woman and moved to Ohio circa 1770. He settled in Yellow Creek, a village of Seneca-Cayuga natives. Logan became a war leader but continued to urge his fellow Cayuga not to attack whites settling in the Ohio Country. His attitude changed on May 3, 1774, when a group of Virginia settlers murdered approximately one dozen Seneca-Cayuga. Among them were Logan's mother and sister. Logan demanded that the Seneca-Cayuga and their allies, principally the Shawnee, revenge the deaths of his loved ones. Cornstalk, a prominent Shawnee leader, still called for peace, but Logan ignored him. He conducted raids in western Pennsylvania, killing thirteen whites in retaliation for the Seneca-Cayuga deaths. His attacks, and escalating Anglo-American settler aggression against the Ohio Country's American Indian peoples, resulted in Lord Dunmore's War. In August 1774, Pennsylvania militia entered the Ohio Country and quickly destroyed seven Seneca-Cayuga villages, which the Seneca-Cayuga had abandoned as the soldiers approached. At the same time, John Murray, Lord Dunmore, the royal governor of Virginia, sent one thousand men to the Kanawha River in modern-day West Virginia to build a fort and attack the Shawnee. Cornstalk, who had experienced a change of heart toward the white colonists as the soldiers invaded the Ohio Country, dispatched nearly one thousand Shawnees to drive Dunmore's force from the region. The forces met on October 10, 1774 at what became known as the Battle of Point Pleasant. After several hours of intense fighting, the English drove Cornstalk's followers north of the Ohio River. The two sides eventually met near Chillicothe to determine peace terms. Logan refused to attend but did send a speech known as "Logan's Lament." Simon Girty, an Englishman that the American Indians had kidnapped and then raised as one of their own, may have read it at the conference. It became one of the most famous speeches by an American Indian in North American history, and is often quoted as an example of traditional Cayuga oratory. Logan spent the remainder of his life trying to prevent white settlers from moving into the Ohio Country. Cornstalk surrendered to the English in 1774, but Logan kept up his struggle. During the American Revolution, he continued to raid white settlements in Pennsylvania. Most accounts describe Logan as becoming despondent and turning to alcohol after his family's murder. He probably died around 1780. Jacob, John J. A Biographical Sketch of the Life of the Late Captain Michael Cresap. Cumberland, MD: J.M. Buchanan, 1826. Jefferson, Thomas. Notes on the State of Virginia. Boston, MA: Printed by H. Sprague, 1802. Mayer, Brantz. Tah-gah-jute, or, Logan and Cresap: An Historical Essay. Albany, NY: J. Munsell, 1867. Sawvel, Franklin B. Logan the Mingo. Boston, MA: R. G. Badger, 1921. Thwaites, Reuben Gold, and Luise Phelps Kellogg. Documentary History of Dunmore's War, 1774. Baltimore, MD: Genealogical Pub. Co., Inc., 2002.